Hello everyone and welcome to June. This is Donna from Modern on Monticello again. The beginning of summer and the warmer weather always reminds me of summer sports events and spending time with my Daddy at the Kinston Indians minor league baseball games in eastern NC. If you have ever watched the movie Bull Durham you know exactly what I'm talking about. It was all about the crowds, the hot dogs and the love of the game. 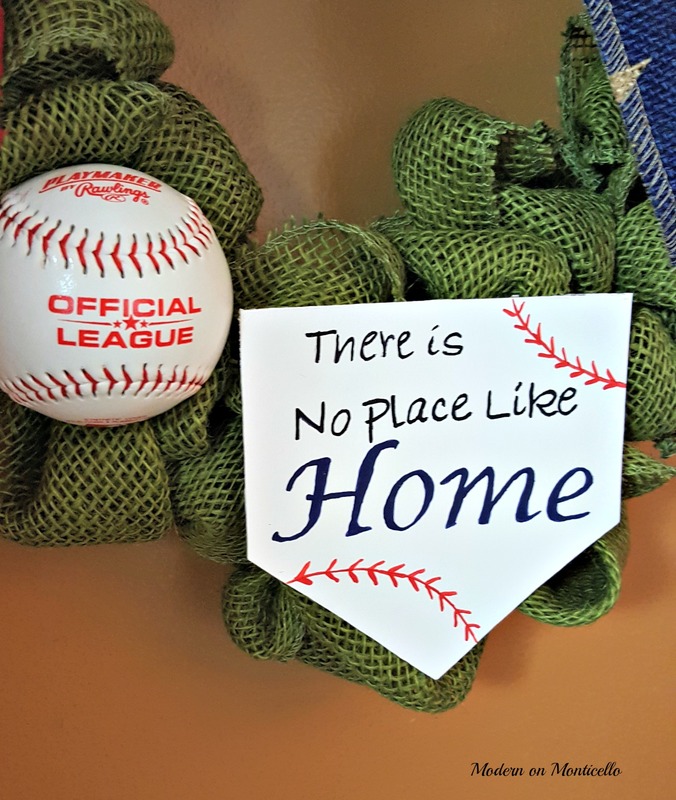 I recently made a wreath for my daughter-in-law's mother featuring a baseball diamond and baseballs, you can see the full post here. 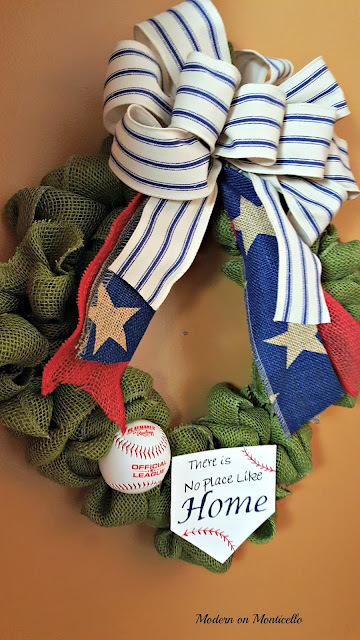 The wreath I am posting about today though was made for my mother and in memory of my Dad's love of the game. To actually make the wreath, it is just a simple method of looping the burlap ribbon through the wire wreath form and attaching the ends of the ribbon to the form with the pipe cleaners. 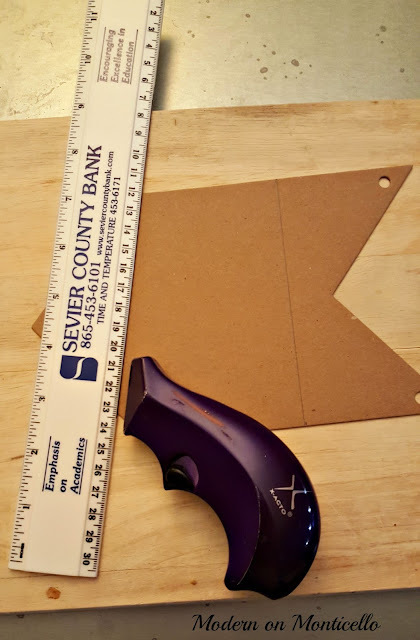 I know there are probably a million different tutorials on how to make a burlap wreath on Pinterest so I will save you the trouble of having to read it again. 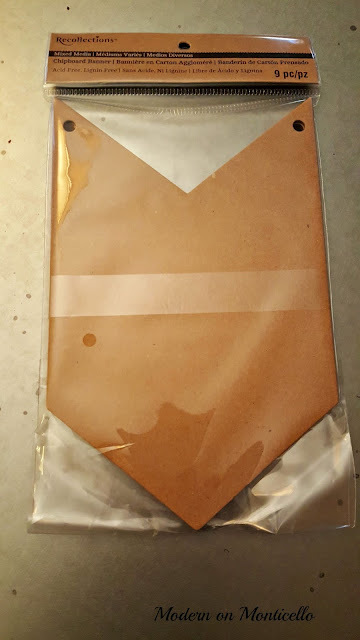 I was not able to find a pre-made cardboard cutout in the shape of home plate, but I was able to find these cardboard banner cutouts at Michael's for less than $2.00 on the clearance rack. To use it as a home plate sign, I simply measured 3 inches from the bottom point, drew a line, and used the X-ACTO knife to cut the cardboard down to size. I applied two coats of white acrylic paint to one side of the cutout. To create the sign, I first created the sayings on my computer and printed it out. Then I applied a layer of colored chalk to the back of the printout, laid it on top of the painted cutout and traced the image with a pencil to leave an impression of the saying on the cardboard cutout. After that it was just as simple as painting over the impression with the red and blue acrylic paints. 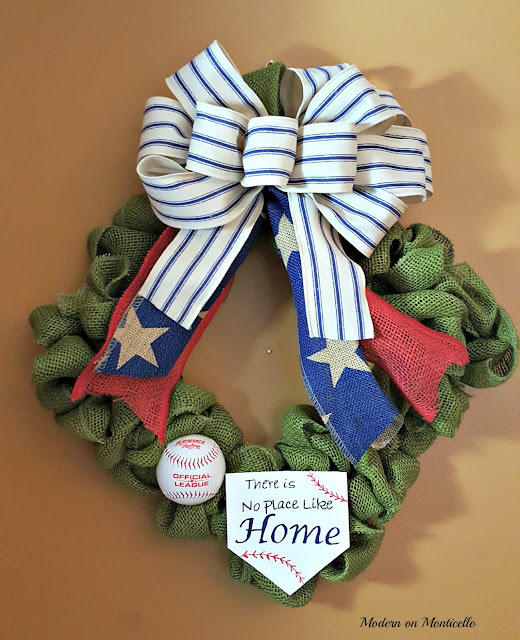 I attached my patriotic colored ribbons at the top of the wreath, hot glued the baseball directly to the wire frame and NOT to the burlap ribbon to make it more secure, and then glued on the home plate pendent. I plan to give this to my mom when I go home to visit over the 4th of July holiday weekend. Great idea! 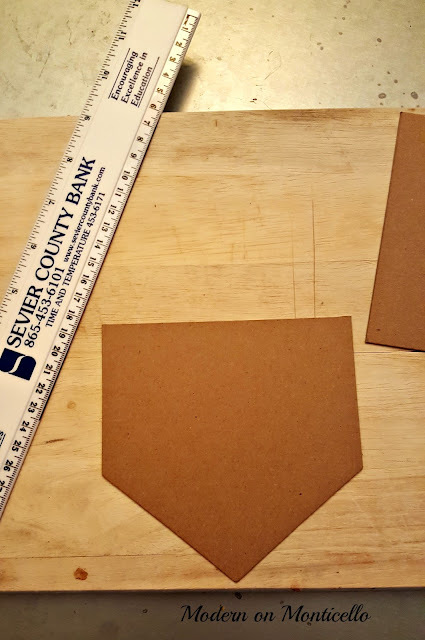 Pinning to make for my sister-in-law who loves baseball!